David Bach: Why Couples Fight About Money - Wall St. for Main St.Wall St. for Main St.
Wall St for Main St interviewed personal finance guru,author, founder of FinishRich.com and Vice President of Edelman Financial, David Bach. In this podcast, David goes into depth about the reasons why couples fight about fight and how to fix it. We also discussed how couples can plan for retirement and the common mistakes they would make. 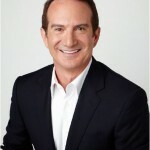 A nine-time New York Times best-selling author with eleven national bestsellers, David Bach has helped millions of people around the world take the actions necessary to live and finish rich. He is a regularly featured financial expert in the media and has contributed to and appeared on multiple shows, including The Oprah Winfrey Show and NBC’s Today Show. He has also been profiled for his expertise in major publications and has produced and hosted public television specials, including Smart Women Finish Rich and Start Late, Finish Rich, as well as was the former host of The FinishRich Minute and Finish Rich with David Bach.